In the modern world time is the most valuable resource, control over which is taken away from most people. The need to generate income forces us to devote over 80% of our time to our jobs and robs us of the ability to control what we'd like to do with our time. The vision of Mycro is to bring control back to the people! Mycro will utilize the blockchain technology to achieve its goal by creating a decentralized peer-to-peer platform for simple jobs and tasks, where users will be able to decide for themselves how much work they are willing to take and how to rate and use the time they have! Money and time are both limited resources with regard to which people think they would make them happier. But would people prefer more money or more time? And how is the preference between the two resources related to happiness? In 2016, thousands of Americans were asked in various studies whether they would prefer more money or more time. Although the majority of people chose more money, the choice of more time was associated with more happiness – even having control over the amount of time and money available was associated with more happiness. The time/money problem is as old as money itself. Time and money are established means of exchange – having both resources is therefore often antithetical. Simply put, people with a high income often have a massive time problem. People with a lot of free time, however, often suffer from a chronic lack of money. The more time a person invests in generating money, the more time resources the person loses. A constant dilemma. There are a lot of people in the world who are rich in time but would love to have more money. Owing to the lack of financial resources, they are, however, concerned with money most of the time. The fatal thing about having a lot of free time is that enjoying free time costs a lot of money. Money for leisure activities and hobbies, money for the family, money for life. A chronic lack of money is depressing and makes people unhappy. If one were to ask a person with financial problems what they desired most in life, the answer would be: more MONEY. Time is a phenomenon that accompanies people throughout their entire lives. In addition to space, time is a basic requirement for all forms of life and the most valuable resource people have. Life without time is simply unfathomable. Unlike other economic resources, time cannot be accumulated and saved. If you „save“ one hour at work today, you will not have 25 hours tomorrow. The great importance of time is also shown by the fact that time is deemed the noun most often used in conversations. Especially people who are very busy often suffer from a lack of time and cannot enjoy a range of entertaining activities. Friends, children, partners, family and hobbies are often adversely affected. Although they are well-off, they lack the time to use the money earned in a pleasurable way. Children, for example, have a radical definition of love. They spell it as follows: TIME. 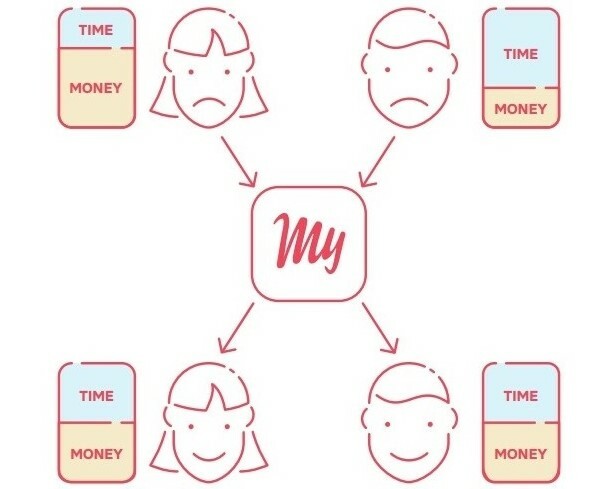 With Mycro we will create an innovative solution for people with time and money problems and tokenize the imbalance between time and money. 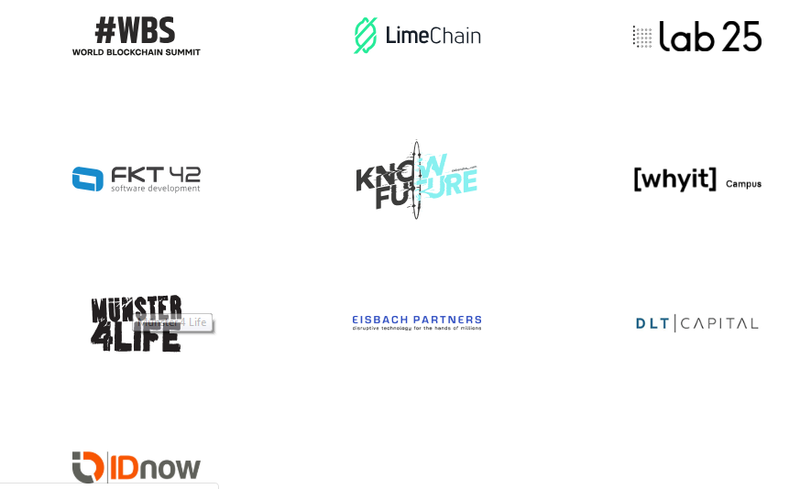 The Mycro Token (MYO) will play an essential role in the decentralized peer-to-peer network „Mycro“. The technological basis for this is the Ethereum blockchain. Mycro is a mobile app which is intuitive to use. Simple jobs on a short-term basis can be posted directly to the mycro network for free. Through intelligent and self-learning algorithms known from dating platforms, Mycro matches these jobs just-in-time with the right jobber. He or she does the job. One person gains time, the other money. One of the fastest growing part of the global labour market. Today, 200 million people are involved – this number is expected to increase to one billion in the next few years. With our solution we give people back control of their time and money and improve the lives of millions of people. 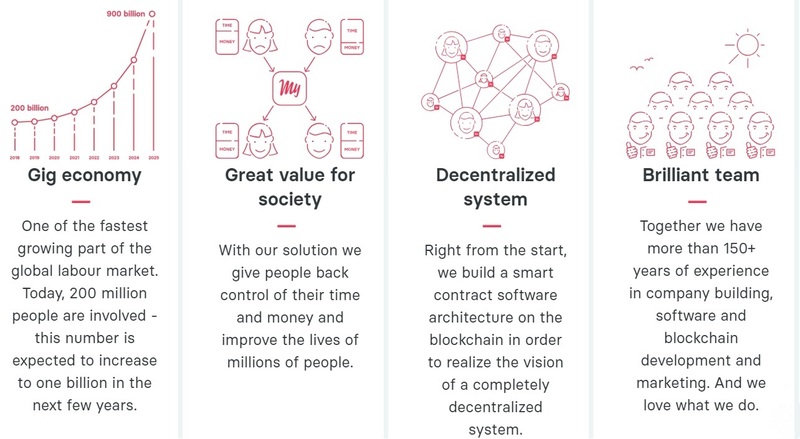 Right from the start, we build a smart contract software architecture on the blockchain in order to realize the vision of a completely decentralized system. Together we have more than 150+ years of experience in company building, software and blockchain development and marketing. And we love what we do. Mycro wants to solve a major problem of society. Through our peer-to-peer network for simple jobs, we give people back control of their time and money balance. During our ICO, a maximum of 100 million MYO will be created. The softcap will be reached at € 3.5 million.